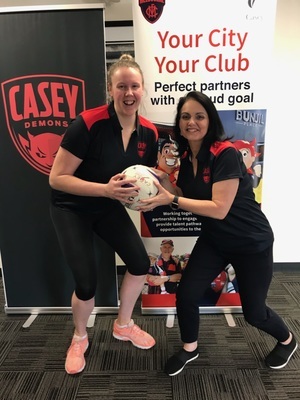 The Casey Demons’ inaugural Victorian Netball League (VNL) squad is coming together nicely ahead of the 2019 season. After gaining a VNL licence earlier this year, the Casey Demons got straight to work in setting the foundations for a strong future. Casey recently announced the signings of Emma Ryde and Erin Bell, both of whom have Suncorp Super Netball experience and will be key cogs in Casey’s offence. Bell is a dual netball World Cup gold medallist as a member of the Australian Diamonds in 2011 and 2015, and most recently played for the Collingwood Magpies in Suncorp Super Netball. Ryde represented Australia at the 2017 Under-21 World Youth Cup, made her Suncorp Super Netball debut in 2016 and grew up in Dandenong. Both players are goalers and coach Robynn Pym is thrilled to have them on board for season 2019. “It’s exciting that we’ve signed Emma and Erin,” Pym said. “They’ve come on board, they live in the area and they’re very excited to take the culture of the group to another level, which I think is going to help the club get a kick start. “Erin has retired from Suncorp Super Netball and lives in the area and her partner Travis Tuck plays football for Berwick. This is her opportunity to give back to grassroots netball as well as still compete at a high level. Whilst Pym has her sights set on building a squad that can immediately challenge the best of the best on court, she is also focused on building a strong link between the club and the community. “I want our girls to know that there’s a greater world outside of netball. If we don’t have the results on court when we start, then so be it, but we want to be pillars of society and the local community,” Pym said. With the VNL season set to kick off in April 2019, the Casey Demons look set to make plenty of noise in their debut season.